MIDI controllers, MIDI controllers MIDI controllers. How I love thee and spite thee! Let me just say that I have a love hate relationship with MIDI controllers. Part of it is due to the fact that I am a self proclaimed MIDIot. It took me far longer than it should have to wrap my brain around the concept of MIDI. To this day I wish I had a more substantial understanding of some aspects. No matter how patiently someone explains these things to me, the same thing happens each time. My eye's glaze over, jaw goes slack and I begin thinking of giant glowing numbers attacking me as I run through a darkened maze of high school textbooks. . .anyways. I started my recording career with a computer and so learned to adjust with a mouse and computer keyboard. I heard the "old timers" speak of missing the tactile involvement of twisting knobs and riding faders, but I had no frame of reference. Oddly, the more I recorded, the more I started to yearn for the ability to make finite adjustments on the fly without the mouse. Enter the MIDI controller. I have to say that up till now, I have been disappointed in the controllers that I have owned. The problem seems to be that I always want to be able to do something either I can't figure out or the controller can't do. I ran out and bought an original Axiom 61 MIDI controller when it was launched in the hope of being able to use it to control my soft synth parameters and maybe use it as a second transport controller. Ultimately, I never could get it to work the way I wanted it to and ended up using it solely for the keys. Which brings us to the new Axiom Pro series of controllers. This is the flagship line from M-Audio and considering my checkered past, I have to say that I am more than impressed. I first saw the new Axiom Pro's at Winter NAMM 09. The idea of a controller that automatically maps to your DAW and plug-ins isn't new but never the less it was exciting. I watched Phil Jackson of Digidesign's demo using the Axiom Pro and I have to say, I was imagining what I could sell to get my hands on one. It seemed impossibly easy to use, even for me. Let's take a look. I read the Quick Start guide and discovered that the Axiom Pro is class compliant and I did not need to install any drivers for my system, (a Mac). So I plugged it in and fired up Pro Tools 8. I then went to my Peripherals menu followed by MIDI Controllers and assigned the in and out ports. You need to assign Axiom Pro Hyper Control In under the Received From drop down menu and Axiom Pro Hyper Control Out under the Send To drop down menu. Upon opening the box you are met with a gleaming white piece of art deco that is very impressive. The weight caught my attention next, it feels solid. The keys feel really good with their TruTouch premium semi-weighted keybed. The original Axiom's keys were supposed to be semi weighted but I never believed it. However these keys feel really nice to my hands. All of the sliders and encoders feel solid as well. Over all, very well made. It can be used as a standalone MIDI controller as well as it's use with software. It has built in MIDI In and MIDI Out jacks as well as a power jack for a separately purchased power supply. So I decided to give it the dummy test. This means that I attempt to use it without reading the manual. The first thing I did was load some of the new Pro Tools 8 virtual instruments. No problem. I was quickly navigating my way around the menu options and happy as a clam to see that even I could figure it out with only trial and error. I learned very fast how to select different tracks and modes as well as to load the factory presets. All without the manual. After playing for quite a while, I decided to crack open the manual and see what else it could do. Make sure to also read the documentation in the HyperControl folder for your specific DAW. (My cd said ProTools 7.4 so I almost missed it, but the information is meant for Pro Tools 7.4 and up.) I found this HyperControl document very useful for more integration with my DAW. M-Audio have produced some introduction videos with the mighty Phil Jackson, (always great) and will be releasing videos on using the Axiom Pro with specific DAW's in a few weeks. The Axiom Pro has two basic modes, Performance and Edit mode which can be toggled from the "Edit" button on the front panel. Most of the time you will be in Performance mode. However Edit mode is used when you need to configure various parameters such as button, knob, or pad assignments or to change keyboard-specific parameters such as the global MIDI output channel or the velocity response curve of the keys and pads. In Performance mode you can select, arm, mute and record tracks, select inserts and sends, adjust gain and panning of tracks and my favorite: adjust plug-in and virtual instruments plus much, much more. 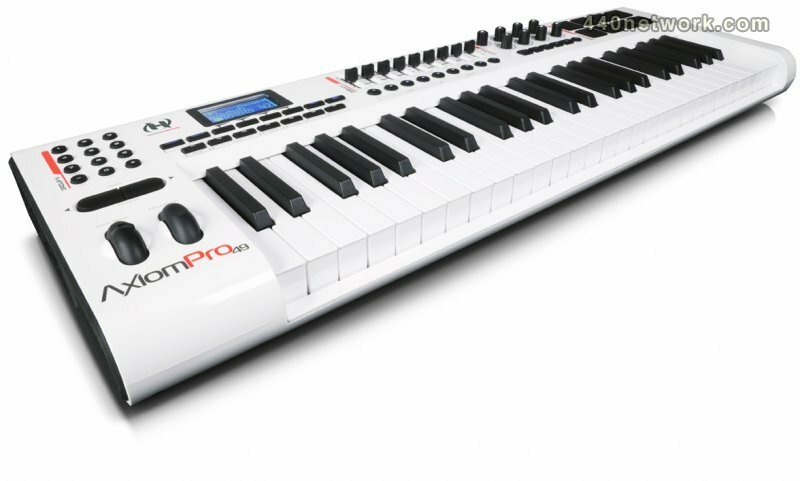 The Axiom Pro uses HyperControl technology. This allows a constant link of information between the Axiom Pro and the software. Adjustments made on the Axiom Pro's endless encoder knobs for instance are immediately reflected in the software. If a plug-in has automatable parameters, then HyperControl will automatically map those parameters and allow you to adjust them within the Axiom Pro. Pressing F1 toggles Mixer and Instrument modes. In Instrument mode you will see the parameter mapping for that page in the LCD. The parameters listed in the left column are assigned to the top four knob encoders. The parameters on the right, to the bottom four encoders. Obviously, some virtual instruments have more than eight parameters to adjust. To deal with this, the Axiom Pro breaks down the adjustable parameters displayed in the LCD into pages that you can scroll through. An example is Structure, Digidesigns sample instrument. It has up to 49 pages of parameters. That's a lot of parameters. Hybrid, Digidesigns excellent hybrid synth has 153 pages. One way that the Axiom Pro helps to minimize the search process is to assign the four "soft keys" below the LCD to 2 page groups each. Press a key once and you get the first page of the group. Press it twice and you get the second. You may also use the new Plug-in Mapping feature in PT8 to make custom parameter set-ups. So if there are certain parameters that you find yourself using more than others, you might want to create a custom Plug-in Map for that plug-in. There are nine dedicated sliders with nine buttons immediately below. If you have a Master fader created, then the right most slider is dedicated to the right most Master fader in the session. The eight buttons control track selection by default in Performance mode. The ninth button under the last fader is the "Flip" button and allows you to scroll through different track modes. In Mixer mode you can use it for Track Selection, Record Arm, Track Mute and Track Solo. By pressing the Edit and Zone/Group buttons at once, you can see encoder/slider/numeric keypad assignments without having to manipulate a knob or slider or pad. just realized that this is getting a bit technical with all the encoder assignment talk and such. I also realized that I was the one writing such tech speak which is a testament to the products ease of use and understanding. Speaking of ease of use, I fired up Reason 4 and had the same excellent results. As of this writing, the Axiom Pro is compatible with Pro Tools, Cubase, Logic, Live and Reason. Hopefully, M-Audio will be adding other popular DAW's to this collection. Okay so forget about everything else. The big questions to answer are, "Is it easy to use?" yes. "Does it do what it's advertised to do? ", absolutely. "Is it hard to figure out and or program? ", no. "Do I really need another MIDI controller, especially in this price range" yes you do if you want that hands on, no hassle experience. "Is it worth the money? ", I think so. I also think M-Audio should offer their own economic stimulus package and knock off about a hundred bucks per model. (To be fair, there really isn't a product out there that can do all that the Axiom Pro can do in any price range.) I absolutely love the HyperControl feature on this unit! Did I mention how nice the keyboard feels on this model?